Outstanding filly Take Charge Brandi (2f Giant’s Causeway x Charming, by Seeking the Gold) is finishing her juvenile season with a flourish adding the Grade I Starlet Stakes at Los Alamitos to her impressive record. Winner of the Grade I Breeders Cup Juvenile Fillies, the D Wayne Lucas trained filly has been kept up to the mark since then winning the Grade III Delta Princess Stakes and now another Grade I feature. She led all the way for Victor Espinoza and fought on to win the 1 and 1/16th mile contest by half a length from Feathered with improving filly Maybellene (2f Lookin at Lucky x Greathearted, by Giant’s Causeway) in third place. 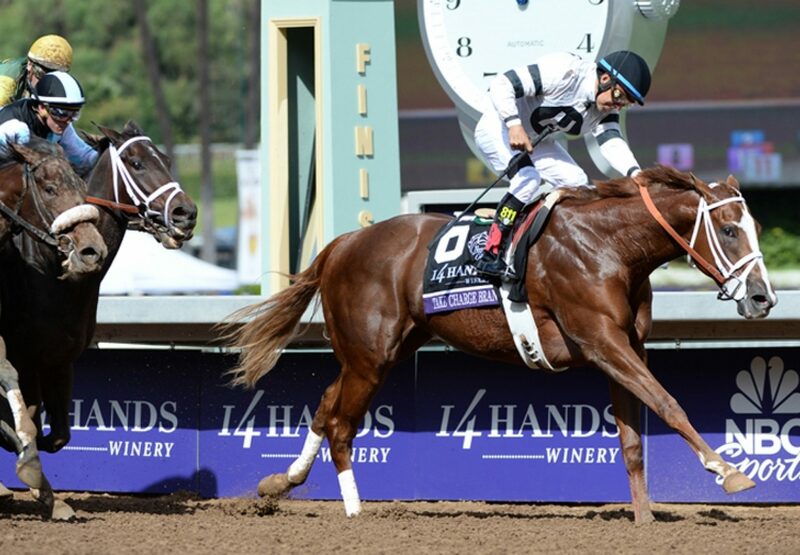 “This is an exceptional filly,” Espinoza said . “To win the Breeder’s Cup and then go to Delta Downs and win and then come back with this race is amazing. I was a little surprised at first that she made that easy a lead, but once she gets to that cruising speed, she’s so quick it’s hard for the others to keep up with her. I was just focused on my horse in the stretch. It seemed like when she felt them coming, she dug in and wasn’t going to let them by.” Take Charge Brandi is now a leading contender for 2YO Filly of the Year and has the overall record of four wins from eight starts with $1.6 million in the bank. “The whole purpose of coming here was to take the doubt out of it [the Eclipse Award for 2-year-old filly] if we could and I didn’t think we had to win to do that,” said D Wayne Lukas. “I told her owner Willis [Horton] that if we ran 1-2-3 we would still be very much in the picture.” A $435,000 Keeneland September purchase for Willis Horton, Take Charge Brandi is the second winner from Charming, a half-sister by Seeking the Gold to Grade I winners Will Take Charge and Take Charge Indy from triple Grade I winner Take Charge Lady. She is the pin-up girl this year for global super sire Giant’s Causeway, who will be Champion North American 2YO Sire for 2015.